The tiny dot in the center of the screen, between the two metal electrodes, is the light emitted by a single atom. 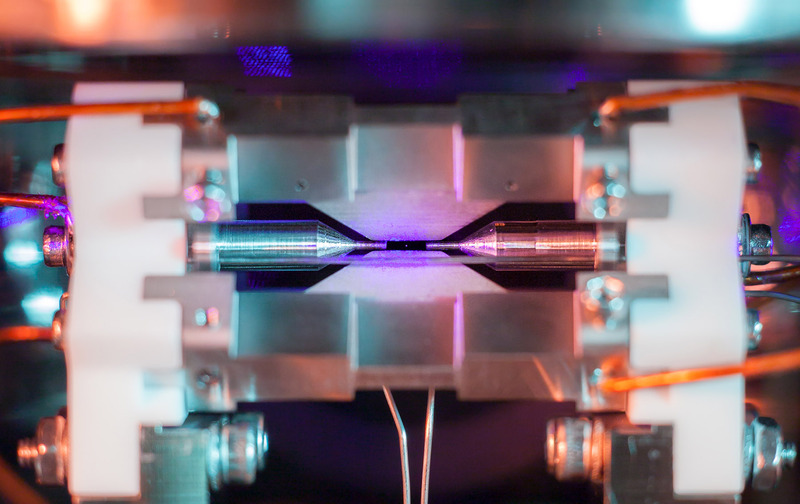 The photo, Single Atom in an Ion Trap, just won the grand prize in the UK's Engineering and Physical Sciences Research Council (EPSRC) science photo and imaging contest. "The idea of being able to see a single atom with the naked eye had struck me as a wonderfully direct and visceral bridge between the miniscule quantum world and our macroscopic reality," said Oxford University quantum physics professor David Nadlinger, who took it. To give an idea as to scale, the gap between the two needlike-like tips is about 2mm, less than a tenth of an inch, so the image is substantially enlarged. Still, it's a scale that we humans can relate to, unlike the nanometer size of the atom itself. Here's how Nadlinger captured the image: A strontium atom was ionized by a laser, then trapped in an ultra-high vacuum chamber (aka, an ion trap) and hit by a blue-violet laser. It was held firmly in place by four electromagnet needles, including the two shown in the image and two others that are out of view. Those created something called a "rotating saddle potential," that trapped the atom in much the same way that a real rotating saddle can trap a physical ball. Nadlinger noted that he's not the first to photograph an atom in this way; Nobel laureate Hans Dehmelt photographed a single barium atom in 1989. His effort, however, was better publicized thanks in part to the EPSCR photo contest. That aside, it's a great photo that literally brought an impossibly small world to light, and Nadlinger is one of the few people that could pull it off. "A back-of-the-envelope calculation showed the numbers to be on my side, and when I set off to the lab with camera and tripods one quiet Sunday afternoon, I was rewarded with this particular picture of a small, pale blue dot."